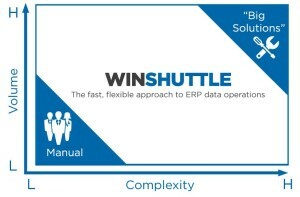 When tens of thousands of users switch from using technical developer targeted tools like Legacy System Migration Workbench (LSMW) to Winshuttle Studio – it’s safe to say the need for an easy to use, flexible and robust replacement is high. That’s not to say LSMW is a bad application or unsuited for a particular job. There is certainly a place for tools like LSMW, it just isn’t the tool to use for integration scenarios that involve a dozen or more data records to be created or maintained. LSMW was built by SAP as a tool for IT to utilise during deployment data migrations, and works great as a single instance tool. In my opinion, the issue is that LSMW has become the hammer that every IT department uses to nail every integration scenario that starts with data in a spreadsheet. This can become a problem not only for the end user, but ultimately for everyone – auditors, the business and in the end, even IT.